Today we have another visit from Shelley, our regular contributor from Down Under. She is here again with her great sense of humor. Take it away Shelley! I was really happy with how the skirt worked as a practical everyday skirt. As much as I like the occasional flimsy, hard-to-walk-in frock, my day-to-day clothes need to work to suit my lifestyle. I commute by bicycle, I stand, walk and sometimes run, I sit down when I get the chance, and I play. In short, I do stuff, and I need my skirt to stick with me throughout the day’s activities. Liesl assured us all that the skirt keeps you modestly covered and doesn’t flip about all over the place. Now that I’ve given my skirt a pretty thorough road test, I can say that she’s right (of course)! It’s the middle of winter here in Australia, so I’ve been wearing my plaid skirt with tights and boots, but I thought no-one will believe that I’m comfortable with my skirt coverage if I’m wearing tights…. So, I made another one and I pretended it was summer – on the day of these photographs that was exceedingly difficult! Brrrr!! 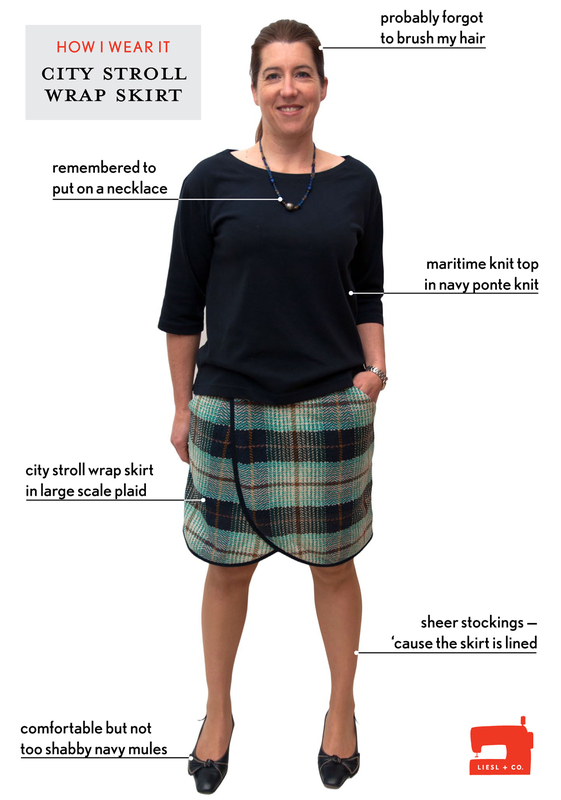 If your typical day includes stopping by a café for a coffee, riding your bike or kneeling down to look at a prizewinning duck then the City Stroll Wrap Skirt is the skirt for you. Just don’t sit cross legged to play LEGO! Just choked on my cheese and crackers laughing at this, thank you Shelley! You surely have a good sense of humor! I always love seeing this skirt but I don’t dare to buy the pattern. I’m afraid it doesn’t suit me. But after reading this, I’m going to just go for it! Thanks Shelley. Shelley, you are too cute! Thanks for the great post. And thanks for braving the cold for us! LOL! Surprised and impressed that it passed the bike test. Hahahahahahaha!!! I spend a decent amount of time on the floor doing legos with the kids while still in my work skirts, and it’s tough to do that modestly no matter what the cut! That’s hilarious …. but great to see it made up and ‘living the life’. I hope to make mine soon, this has given me a ‘gee up’. Thank you so much for this post. You look great in your skirt. I also ride bicycle as main tranportation and was wonderig about this. Is it ok to ask which size you made? I LOVE this post! Lots of us can really relate to this. My number 1 reason for not buying this skirt right away was the worry about coverage, especially when sitting at a desk which is what I do most of the day. I think I will give this skirt a try now. Thank you! Ha! I love this post so much! Next time I am going to see a prize winning duck I will have to keep this pattern in mind. How much longer before you come up with a City Stroll Skort with bike shorts underneath for one of your mashups? 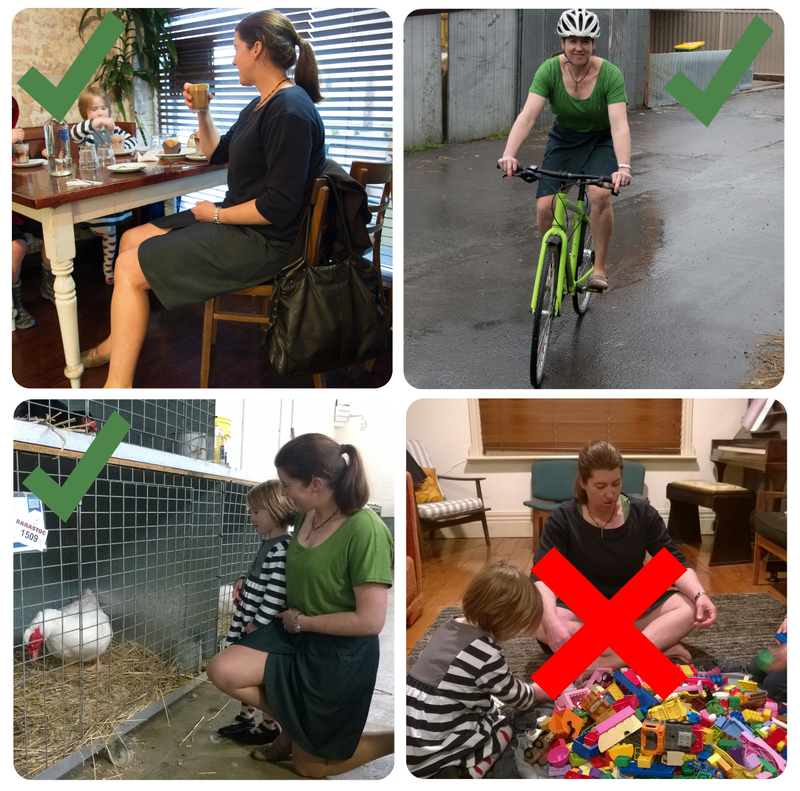 I noticed that I don’t wear skirts as often as I might precisely because of the “Lego Issue”. Oh thank you all, what lovely comments! Maria Sasse re sizing, in the Liesl + co patterns I measure as bust 12, waist 12-14 and hips 14. The first plaid one is a 14 and the green one a 12. Both of them I added 1″ length. I’m 170cm (5’7″) tall. I probably didn’t need the extra length but my legs are much better below the knee and I flatter myself by thinking I’m tallish (barely above average is more realistic). It is surprising it’s bikeproof, but truly it only opens another inch and a half at most. And Teri I’m so glad to be able to recommend a skirt for duck admiring should you find yourself in such a situation! Shelley you are best… chuck out the rest! This is such a cute skirt, love it on you! 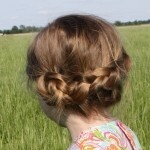 I think I need to try this pattern out myself now. I too as a bit worried how it would wear when I am out and about with the kiddos.